Devices often have other tabs, such as Advanced, Resources, and Power Management. Most network adapters have an Advanced tab. As shown in Figure 10, these options can control transmission preferences. You should change these options only if you are trying to resolve specific performance or connectivity issues as directed by the device manufacturer or a Microsoft Knowledge Base article. The setting that causes the most problems is Speed & Duplex. Most of the time, you’ll want this set to Auto Detect or Auto Negotiation. Sometimes, however, to correct a specific problem, you must use a preset speed and duplex setting, such as 100 Mbps Half Duplex or 1000 Mbps Full Duplex. You should do this, however, only when this setting is recommended based on your network configuration or the issue you are trying to troubleshoot. Figure 10. 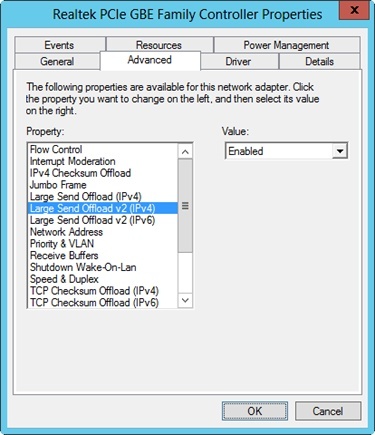 You’ll find that most network adapters have an Advanced tab for setting transmission preferences. Any device that uses system resources will have a Resources tab like the one shown in Figure 11. DMA The DMA channel used by the device. Values are shown as integers, such as 02. Memory Range The range of memory addresses used by the device. Values are shown in hexadecimal format, such as E8206000–E8206FFF. I/O Range The range of I/O ports used by the device. Values are shown in hexadecimal format, such as 5400–543F. IRQ Line IRQ line used by the device. Values are shown as hexadecimal, such as 0xFFFFFFD8 (-40). Figure 11. Any device that uses system resources has a Resources tab. Devices can use multiple I/O and memory ranges. For example, the Video Graphics Adapter (VGA) adapter on one of our computers used three I/O ranges and three memory ranges. 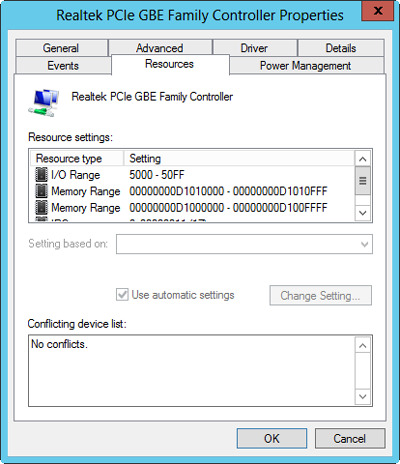 Additionally, multiple PCIe devices can share the same IRQs when using Advanced Configuration and Power Interface (ACPI) BIOS. This is because ACPI BIOS allows IRQ sharing.